Dry eye occurs when there is low tear production, or when the tear quality is poor and the tears evaporate too quickly. When people blink, tears spread evenly over the eye, keeping them smooth, healthy and clear. This is an important step for healthy, comfortable vision. However, it is estimated that 4.88 million Americans age 50 and older have dry eye, and suffer from irritated, burning and scratchy eyes. In most cases, dry eye can be managed successfully; but colder weather is a common dry eye irritant of which people may be unaware. Dry eyes are often a common complaint for contact lens wearers during the colder, winter months. A common trigger for dry eye can be the humidity in the air. 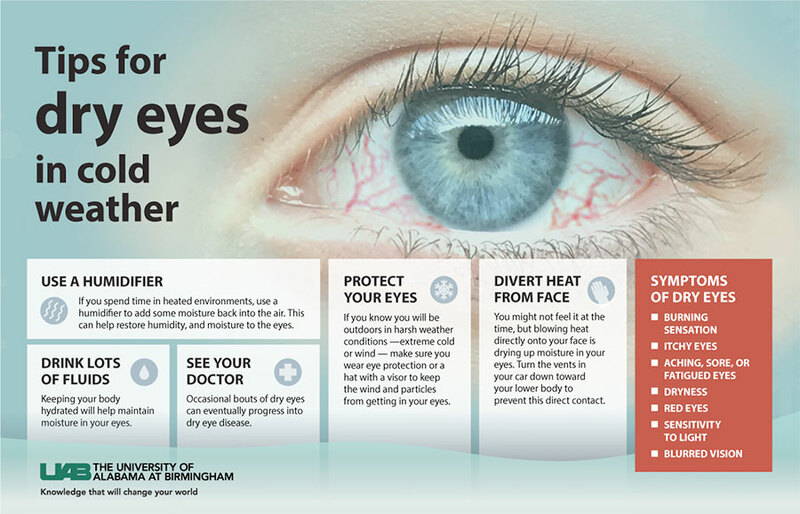 University of Alabama at Birmingham Department of Ophthalmology instructor Marissa K. Locy, O.D., says there are a variety of tools people can use to prevent dry eye in colder weather. Use a humidifier: If you spend time in heated environments, use a humidifier to add some moisture back into the air. This can help restore humidity, and moisture to the eyes. Clean your contacts: With cold weather, your eyes could dry even more with contacts, so make sure you are always wearing clean contacts to reduce risk of infection and itching. Drink lots of fluids: Keeping your body hydrated will help maintain moisture in your eyes. Protect your eyes: If you know you will be outdoors in harsh weather conditions — extreme cold or wind — make sure to wear eye protection or a hat with a visor to keep the wind and particles from getting in your eyes. Divert heat from your face: You might not feel it at the time, but blowing heat directly onto your face is drying up moisture in your eyes. Turn the vents in your car down toward your lower body to prevent this direct contact. See your doctor: Occasional bouts of dry eyes can eventually progress into dry eye disease. People with dry eyes may experience itchy, aching, fatigued, burning or red eyes. Blurred vision and sensitivity to light may also occur. Although dry eye cannot be cured, it is possible to relieve symptoms with eye drops and ointments, medication, or plugging some of the tear ducts to slow the drainage of tears once they collect on the eye’s surface. Certain new treatments can provide significant relief. A simple way to gauge dry eye risk is by taking an online quiz at uabmedicine.org/dryeye. UAB Callahan Eye Hospital physicians are well-equipped to treat patients with varying degrees of dry eye.